What is the Popular Topics beta and frequently asked questions about it. What is the Popular Topics Beta? The Popular Topics Beta helps you understand what your landscape is talking about, who’s talking about it, how frequently they’re doing so, and how engaging it is. It identifies common keywords and phrases used in your landscape’s social posts, and uses natural language processing (NLP) to make sure we’re showing you the important topics. Who can get access to this beta? Everyone! We believe that this information would be helpful to anyone’s social strategy so we’ve unlocked it for all our users. Where can I find the Popular Topics Beta? The Popular Topics panel can be found on any Social Posts page, below the Activity & Engagement and Hashtags panels. 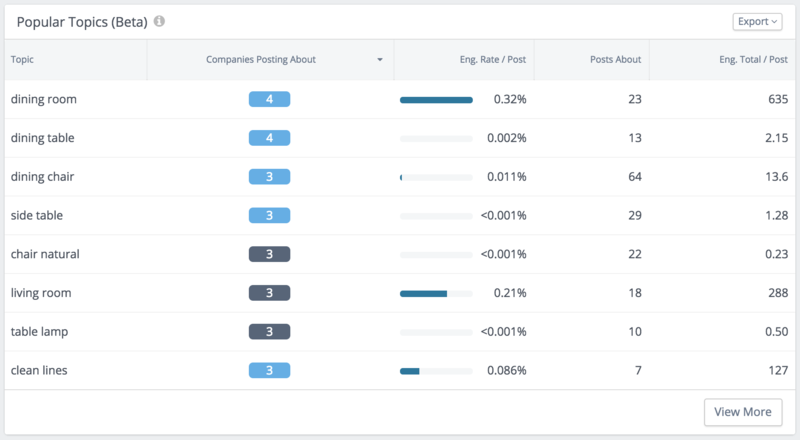 It analyzes all of the social posts in your view (up to 5000 posts at a time) so you can use the date picker, company filter, channel selector, and post type filter to narrow in on any set of social posts you’d like to analyze. How can I give feedback and ask questions? We greatly appreciate your feedback and questions because it helps us improve our beta. You can email our Product Manager, Tiffany at tiffanyl@rivaliq.com.